I went to the pantry and found a quart of last year’s tomato sauce for a pasta meat sauce. I made quite a bit, adding a big onion, several peppers from the patio garden, Italian sausage, lots of minced garlic, and plenty of fresh herbs. 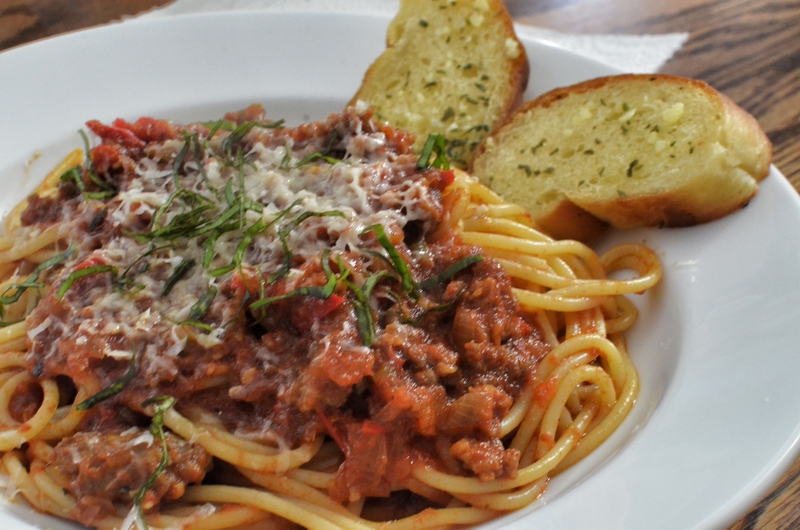 We had it on spaghetti for lunch, leaving plenty sauce for a supper dish. TaMara’s cast iron purchase made me do this in one of my skillets. This 10 incher is just big enough for 8 ounces of cooked rigatoni with sauce and some mozzarella we had leftover from yesterday’s pizza. I noticed that a couple of the recipes I looked at called for assembling the dish in individual sized casseroles but I don’t have anything suitable so I used the pan I had. 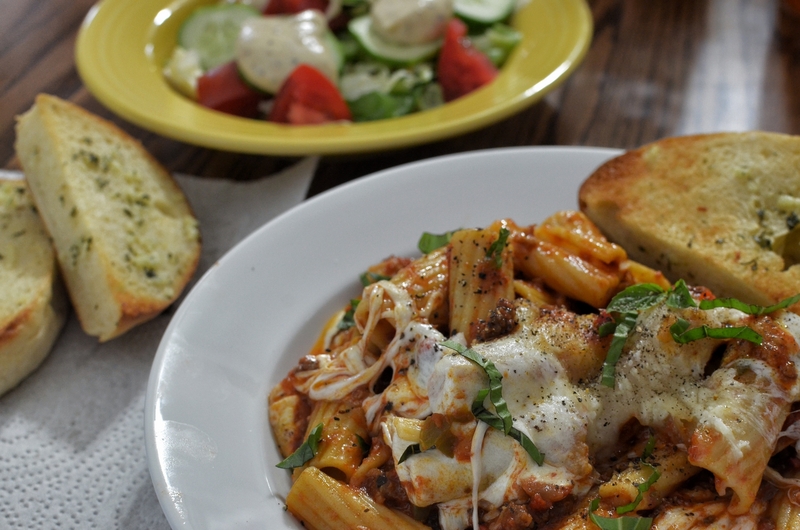 I discovered why the mention of individual portions – you need a helper with scissors to cut the mozzarella strings when spooning the pasta into bowls! It was pretty cold overnight, down into the teens. We got a bare dusting of snow but that will go away today. Strong south wind and warming temps today, we have made it into the 40s but there is a chance for sprinkles later. Soup sounded pretty good. 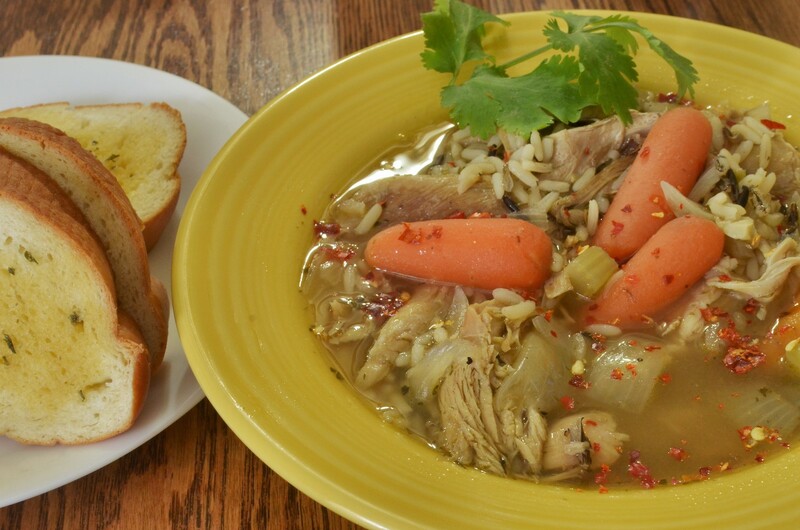 This one has the turkey and some baby carrots along with a wild rice mix from Zatarain. They make good rice mixes and we really like the wild/long grain rice mix they sell. It’s been absent from the local market so we ordered a case online. 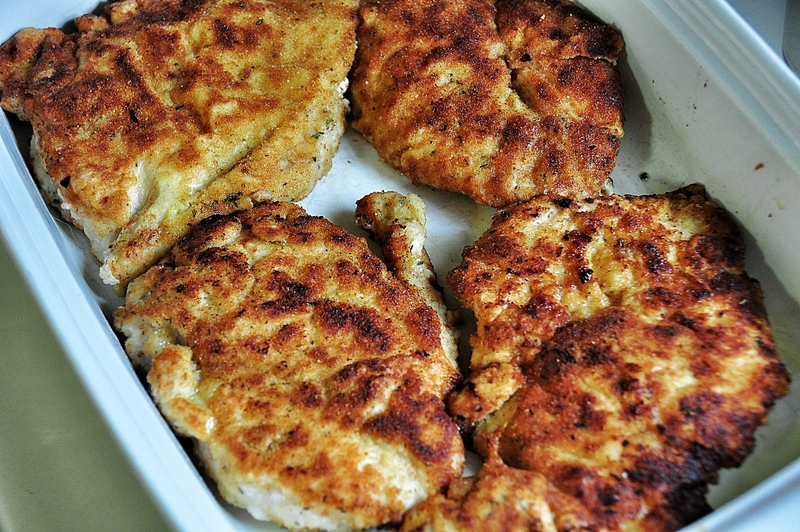 Start by pounding boneless, skinless chicken breasts down to about 1/2″. I dredged these in seasoned flour, dipped them in a beaten egg and milk mixture, and then through bread crumbs. They spent about 4 minutes a side in an olive oil saute and then went straight into a casserole. I made a sauce out of odds and ends: a few fresh cherry tomatoes, a bit of leftover pizza sauce, a can of diced tomato bits, and a little tomato paste – all cooked with minced garlic and diced onions and the usual herbs and seasonings. 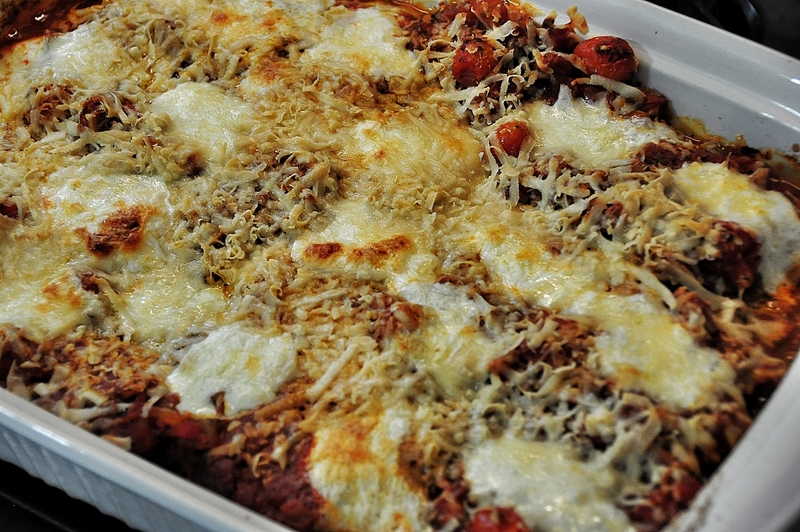 The sauce went atop the chicken, and then the dish was layered in mozzarella and grated Parmesan. 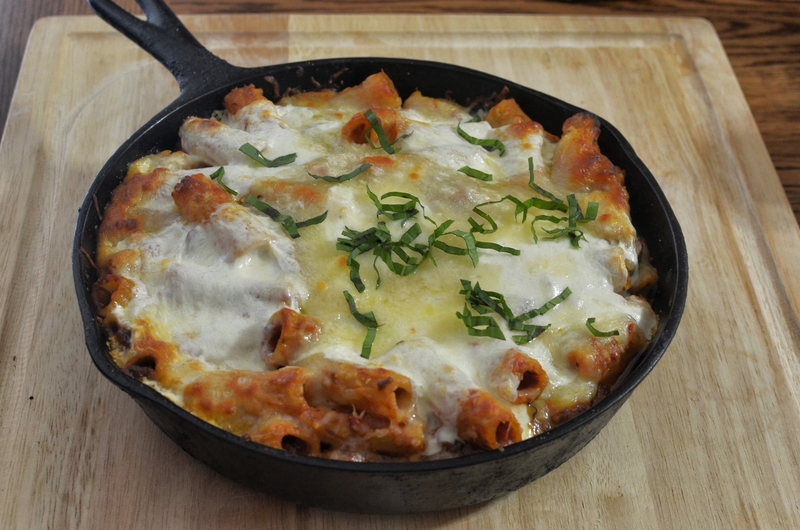 The casserole went into a 400 oven for about 20 minutes until the sauce was bubbling and the cheeses melted a bit. I served it over angel hair pasta today, garnished with sprigs of fresh basil and a slice of buttered garlic brad. Leftover beef is handy for all sorts of dinners. 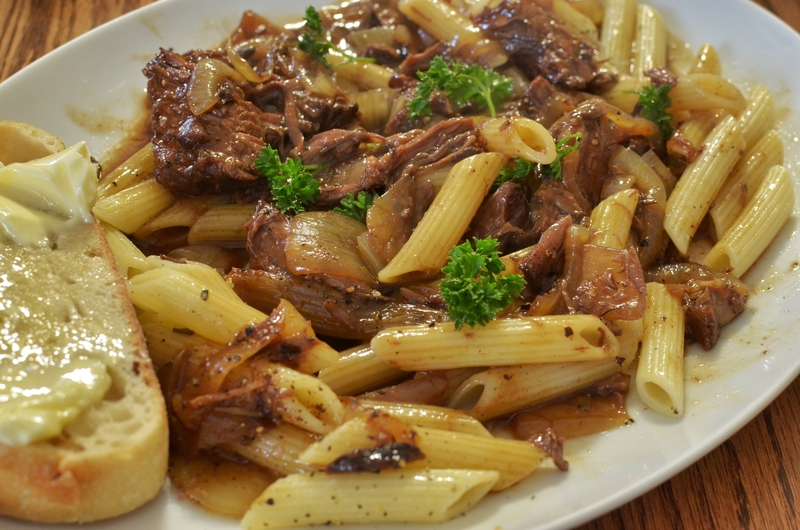 I passed over the usual beef stew and nearly went with a version of Italian beef that always works well for me and settled on the pasta. My first look through the pasta bin was for wide egg noodles but there weren’t any. Rice was another option but the penne was going to be a little quicker. I caramelized an onion in a sauce pan, added broth and reduced that before adding the leftovers from the crockpot roast. I’m happy with the dish. Haven’t posted a sammich pic in ages! This one is apple smoked pork piled onto a slice of whole clove garlic bread that the local market is now stocking, it’s a par-baked loaf that needs 10 minutes to finish in the oven. It’s kind of spendy but it’s so easy I find it’s worth it. Still working through the jar of hot Chicago style giardiniera. On the side are some of my own pickled peppers from the garden this summer. This is so good I find it amazing that it is so easy to make. I’ll be doing this one again, and will probably do some adjusting to better suit my taste. More garlic, for sure, and a sprinkle of red pepper flakes. I may omit the canned tomatoes and go with the cherry tomatoes I grew in the patio garden – they make a most excellent sauce. A note on the cheese: Mrs J picked up a bag of this at the store – we both agree that it is very good in this dish.